The Raspberry Pi Foundation has upped their entry in the single-board computer competition. 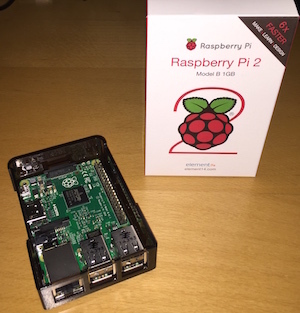 Raspberry Pi 2 Model B boasts a quad core ARM CPU and 1GB of RAM. More important: Benchmarks show that the board is 6x faster than the previous model. And the performance bump has been achieved while the price remains low: Roughly $45. Getting the board up and running is easier, too. You can buy a pre-built Linux image on micro SD. Or you can download the New Out Of the Box (NOOBS) image yourself. Depending on the speed of your internet connection, you can be up in running in less than an hour. Download the NOOBS image and unzip it. Format a micro SD card that’s at lease 4GB in size. Drag the unzipped NOOBS files to the micro SD card. Insert the micro SD card into the Raspeberry Pi, apply power, and watch it boot. Having done things the old way, I was surprised that the process was so simple this time. Hats off to the Raspberry Pi Foundation for a great installation experience. Note that the cursor will not move while you type the password. Next, start the X Window environment. And your desktop will look something like this. This incarnation of Raspberry Pi comes with Ruby 1.9.3 pre-installed. Of course, if you want to manage multiple versions of Ruby, RVM is a great way to go. To install RVM, first run gpg to verify that you will get an uncorrupted (or un-tampored with) version of RVM. And finally, let the current terminal session know that RVM is installed by typing the following at the command line. RVM will download dependencies as part of the installation process. From there, you can create RVM gemsets and gem install rails or any other libraries you may need. More documentation can be found at http://rvm.io.